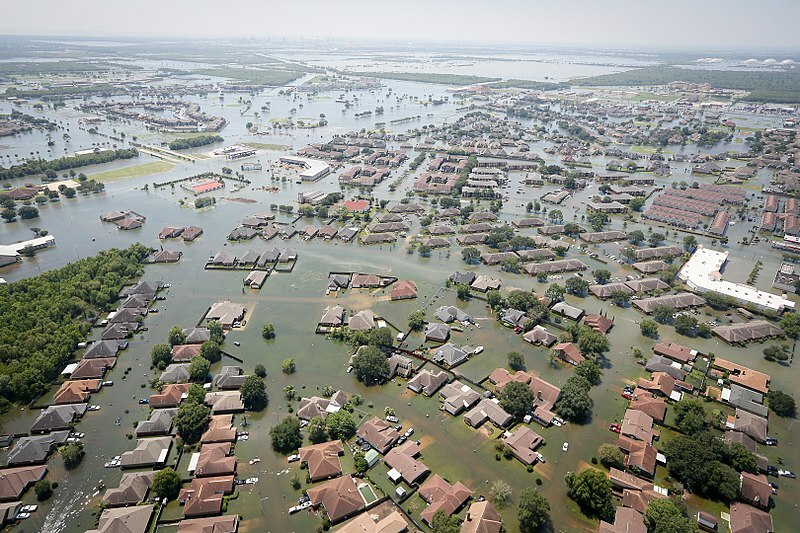 When Hurricane Harvey battered the Gulf Coast region in August of last year, communities worried about its devastating, lasting impact – from the significant personal loss felt by families to the staggering financial clean-up costs that threatened to overwhelm towns and cities. And, in addition to the loss of human life, flooded homes as well as entire neighborhoods, not to mention the indefinite shuttering of businesses, communities were forced to confront serious environmental concerns in real time as the storm raged in the area that is a well-known hub of the petrochemical industry. Aerial view Hurricane Harvey's effect in Texas, courtesy of South Carolina's Helicopter Aquatic Rescue Team. No situation better illustrated this than the one that unfolded at the Arkema chemical plant in Crosby, Texas, which lies northeast of Houston. As rain fell and water levels rose, it quickly became clear that the plant’s emergency preparedness plan was no match for the brute force of Mother Nature. Multiple contingencies failed to prevent the degradation of organic peroxides stored at the plant which eventually caught fire. These peroxides must be stored in low-temperature facilities and rising waters inevitably knocked out power to these facilities and later to the refrigerated trucks the peroxides had been transferred to. This is what caused the explosion that made national headlines and required the evacuation of everyone within a 1.5 mile radius of the plant. Thankfully, organic peroxides, which are used in the manufacture of a wide variety of consumer products, aren’t hazardous chemicals, but that doesn’t mean they aren’t harmless. Furthermore, the Arkema plant does indeed manufacture hazardous chemicals and critical information about them was woefully lacking as plant workers, emergency responders, and fire officials tried to mitigate the effects of the burning trailers full of organic peroxides. Where were the hazardous chemicals stored and how and in what quantities? What would have happened if the fire had spread to these other, more dangerous chemicals? This type of information is supposed to be routinely shared and made available to the public under a variety of federal reporting rules and regulations that have been implemented since the late 1980s, beginning with the Emergency Planning and Community Right to Know Act. Chemical companies are required to submit plans that address how they’ll respond to chemical releases, spills, and leaks resulting from accidents and, increasingly, natural disasters, as well as provide insight into the types of chemicals they process or manufacture. But tension has always existed between chemical companies who understandably seek to protect their Confidential Business Information (CBI) and regulators at local, state, and federal agencies who seek to adequately educate the public about and protect it from dangerous chemical incidents. This tension is unlikely to go away anytime soon. Chemical companies lobbied against additional safety regulations imposed under the Obama administration, and the enforcement of them by the Environmental Protection Agency has been delayed under the Trump administration. As professional researchers who serve as neutral fact finders we’re used to reviewing public records obtained via targeted Freedom of Information Act requests that are heavily redacted to ensure that CBI remains exactly that — confidential. Typically, we conduct research into historical environmental problems at chemical or other industrial sites stemming from policies (or lack thereof) created during an era in which little was known about the lasting environmental impact of certain chemicals, nor the resulting financial liability responsible parties were to face when they surfaced, nor the economic and social costs to affected communities forced to clean-up decades-old hazardous sites. However, as a result of technology and environmental awareness and oversight, we’re in a much better position today to prepare for and respond to chemical disasters no matter how they occur. Being armed with adequate information, which is what modern reporting rules ensure while also respecting companies’ needs to protect propriety information, not only helps protect communities and the emergency personnel who serve them, it also helps lessen the inevitable financial and legal burdens chemical companies will face should they find themselves in a similar situation to Arkema. It no longer takes decades for environmental problems to be discovered and addressed and thrust into the public’s conscious. To be sure, within mere weeks of the explosion, a lawsuit was brought forth by emergency responders, who claim that they were not properly warned about the dangers of the chemicals stored on Arkema’s property. Arkema Plant Explosion. Photo Source: ABC News/KTRK. Though the investigation is ongoing, one finding has become obvious – that Arkema’s emergency preparedness plan was inadequate when tested by Hurricane Harvey. It’s one that is not surprising given that, since 2016, CSB has indicated that poor emergency planning was a recurring finding in their investigations of chemical incidents throughout the country. And it is one that highlights the need for chemical companies and regulators to work together to share information as part of emergency preparedness reporting and planning, which can help protect everyone’s interests -- especially in an area such as the Gulf Coast, which is chock-full of chemical plants and one that is increasingly prone to natural disasters.